A few years ago I determined to understand the Holy Spirit more fully. I opened my Bible to the book of Acts and began to read through its chapters, prayerfully and systematically. Next to my Bible I had a blank journal where I recorded my findings. I was particularly interested in carefully studying each instance where the Holy Spirit and prayer were recorded as part of the narrative of the development of the gospel mission in the early church. Through this time of intentional study, and journaling, I learned so much more deeply about work of the Holy Spirit, God, and prayer. The book of Acts is a marvelous gift to us today. It records the foundation of the new Christian mission was prayer. It is full of stories of how the Holy Spirit works with humans to fulfill the will of God as He builds His church. They united their voices in prayer for mission. We get a strong emphasis for United Prayer from the General Conference. 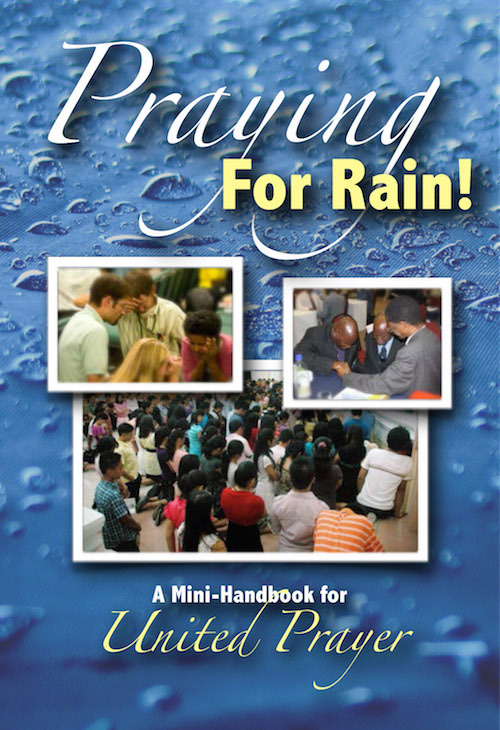 The booklet “Praying for Rain” is available in 16 languages. The first item of our vision statement highlights a United Prayer focus as a foundational principal. While it is important to pray by yourself, this emphasis is on praying together for the Mission and Vision of the Man-Sask Conference. I have seen God work marvelous miracles to fulfill the Mission and Vision He has given to a church. God’s work in a given territory has always been founded on His people joining that mission by filling their churches with much prayer for fruitful outreach. This is United Prayer. What does this look like? How can your church or group learn United Prayer? First read the book linked above. Then here are a few simple suggestions. We suggest as it does in the booklet from the General Conference that you break your prayer time into sections where you emphasize one topic at a time. Try this: the prayer leader(s) will lead into praise, followed by a time of confession, a time of petition for God to bless the Mission and Vision He has given to the Man-Sask Conference, and finally end with a time of thanksgiving for the miracles God will perform for us. Prepare the people for a little longer time of prayer, perhaps 5-7 minutes, sometimes longer as may fit the occasion, and as the Holy Spirit may lead. This may include a time when the prayer is focused on God leading the local church, school, or group to understand what God wishes them to become. This is a time to ask God to reveal His Mission and Vision for your local church, school, or group. I believe that God honors our prayers, God listens! God hears! God answers! If we come together in United Prayer you will find the Holy Spirit revealing God’s will and blessing the people of God. The book of Acts is a marvelous gift today to us! As the United Prayers at the beginning of the Christian church were so powerful, so shall it be just before the second coming. I encourage you spend time in God’s Word, especially the book of Acts, and unite your prayers with others. There is power in prayer, especially as we pray together!